Oil on panel, 32 x 45 cm. A major fire has broken out in a small Dutch village. The billowing smoke from the fire covers most of the night sky, while the devouring flames are reflected in the river. 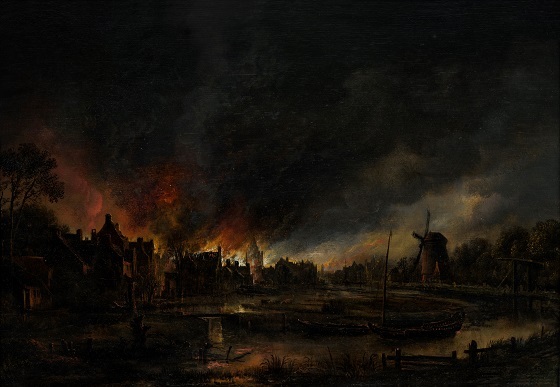 Unlike the artist’s other night-time paintings, it is not the light of the moon, but instead the flames of the fire that illuminate the surrounding landscape with a reddish-Brown sheen. Nocturnal scenes became a popular subject in the Netherlands in the 1640s and often formed a poetic and atmospheric framework for architectural, religious and landscape paintings. Most of the ones painted during the Dutch Golden Age are from the area around Haarlem and Amsterdam, which is also where Aert van der Neer and his teacher Rafaël Govertsz Camphuysen each completed an extensive series of landscapes bathed in moonlight.